I love pizza. I love that you add whatever veggies you want and then cover it in cheese. Mmm, cheese 🙂 I love that it’s a cheap meal when you make it yourself even if you add a salad and ice cream for dessert. I love that my mom for many years made us pizza for parties and everyday dinners. Thanks mom again for instilling in me a desire for healthy and cost effective cooking, I love you! The above unbaked pizza was made with all of the non-optional ingredients listed. I also used the seasoned olive oil that the olives came in for brushing the crust with. A tender, fairly light and flavorful dough that tastes delicious despite being mostly comprised of whole grains. I use organic hard white whole wheat flour(unifine) from Azure Farms. You may have to sub more white flour if you use a coarser whole wheat flour. This makes a ton of dough! At least enough for 6 medium pizzas. Also a good dough for cinnamon rolls and loaf bread. You can freeze grapefruit sized portions wrapped in plastic wrap for up to a month. Thaw overnight in the refrigerator. Mix the first 3 ingredients together in a bowl that holds at least 4 cups. Let yeast proof for 5-10 mins, if it gets too bubbly stir it down. Add the olive oil, honey, salt and hot water to your stand mixer. Using a dough hook mix for about 2 minutes, add the oatmeal, white flour and 4 cups of whole wheat flour. Mix until the flour is moistened. Add the proofed yeast and enough whole wheat flour until the dough is barely sticky. Mix on a low speed for 6-8 minutes until smooth. Lightly grease top of dough with olive oil, cover with a damp towel and let rise for 30 minutes. Punch dough down and let rise again for 30 minutes. Consider making 2 or more pizzas at a time and freezing the leftover slices. Choose your toppings wisely as you don’t want to overload your pizza. Spinach and kale cook down so much they are barely noticeable in taste but the nutrition is there. 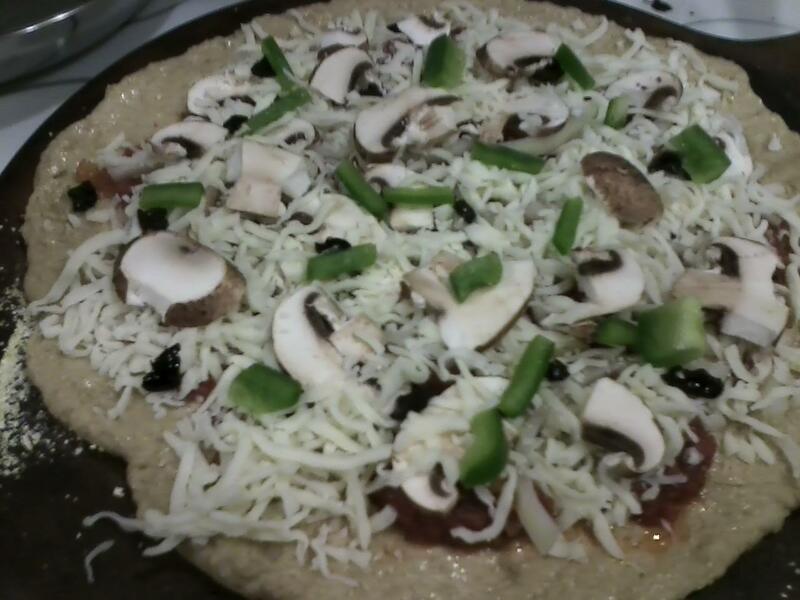 Substitute your favorite veggies or sprinkle some herbs on the crust. Place 2 Tablespoons of cornmeal on pizza stone. Spread dough until it’s roughly half what you want the finished thickness to be. Brush olive oil 1-2″ from edge. Spread sauce over dough, add onions, then kale, cheese and remaining toppings. Bake for 8-12 minutes until cheese is melted, pizza crust is lightly browned and is no longer doughy.